Bruschetta is a typical Italian appetizer made with grilled bread topped with a mixture of tomatoes and garlic. It's a delicious treat and fun to make and eat. 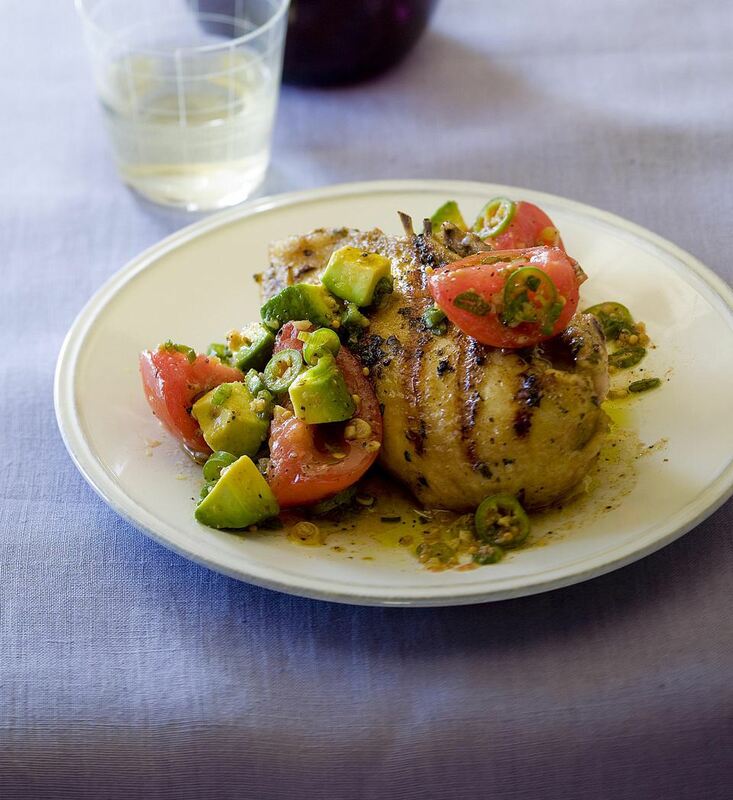 In this recipe, bruschetta toppings are added to grilled chicken breasts for a main dish that is beautiful, healthy, and delicious. You can use whatever ingredients you'd like in the topping for this chicken. We like the combination of tomatoes and avocados with some lemon juice, basil, and Parmesan cheese. Serve this wonderful recipe with a green salad tossed with mushrooms and drizzled with a creamy Italian vinaigrette and some fresh fruit. A nice glass of white wine would be the perfect finishing touch. For dessert, serve a lemon pie or some brownies. Prepare and preheat the grill for medium heat. Brush the chicken with the olive oil and sprinkle with the garlic salt. Place the chicken on grill, cover, and cook for 10 to 12 minutes or until the chicken is almost done, turning it once. Meanwhile, combine the tomatoes, avocado, basil, green onions, garlic, salt, pepper, and lemon juice in a small bowl and mix well. When the chicken is almost cooked, top each piece with some of the tomato mixture and sprinkle with the Parmesan cheese. Cover the grill and cook 2 to 5 minutes longer or until the chicken is thoroughly cooked to 165 F.